Easy to install and configure, it includes a web-based application that has a variety of features. From internet voicemails to web conferencing, 3CX will make your business communication a simpler and more efficient process. With the transition to digital communication, 3CX will allow your employees access to communication throughout the world. 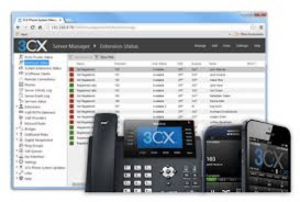 Even when overseas, you will be able to access 3CX either through the web-app or your smart phone. Allowing communication to become as free as ever. Save on call costs with ‘out of the box’ configurations for popular SIP / VoIP providers.